Traditional marketing and content marketing have something important in common. In order to get the business results you want — more leads, sales, and profits — you have to do them consistently over time. In traditional marketing, you don’t place one ad or send out one brochure and think your work is done. And in content marketing, you can’t write five blog posts or record three podcast episodes and expect them to transform your profits. If you want content to grow your business, you have to produce it regularly. I compared it to a hamster wheel here. It’s a lot of work, and you have to keep it up. That’s why I recommend adopting the lazy person’s approach to content marketing. Surprised? There’s a lot we can learn from lazy people. I’m not one of those people who hops out of bed in the morning, ready to take on the day. I’m more like one of those people who needs to avoid conversation or writing emails until I have at least one cup of coffee in me. I wake up groggy and not completely with it. And I’ve learned to work around this with a little system. In my kitchen, right where I can see it when I walk in, I have all my coffee gear set up in one place. The coffee, the fresh coffee filters, the mugs, and the sweetener options are all within a three-foot radius. When I wake up, I only need to press one button to start the process of making my first cup of coffee. We can do the same thing with our content marketing. Once we’ve determined what we need, we can set ourselves up with a content marketing system that minimizes friction and helps us fight any resistance we may feel toward creating content. I’ve used this system for years without change. More on that later. Sonia Simone has established that most business shortcuts are beneficial for the person who’s trying to sell them to you, but not for you. When you see shortcuts like these, we recommend you turn around and begin running in the other direction. When you find content creation shortcuts that work for you, embrace them and make them part of your process. I can only imagine how disastrous my mornings would be if I had to deal with a different coffeemaker every time I walked into my kitchen. Instead of going from groggy to caffeinated within about five minutes, I’d spend 15–20 minutes wandering around my kitchen looking for the user’s manual and trying to figure out where to add the water and coffee grounds. It’s the same with content creation. Once you’ve found tools that work for you, resist the urge to try the latest shiny content creation tool. The magic comes from using them consistently over time. Let’s put lazy people on a psychoanalyst’s couch just for a moment, shall we? What’s the true motivation behind their lazy approach to life? My guess is that they want to expend the minimum amount of effort to get the maximum positive effect. Lazy people want less work and more results. A lazy person looks at what’s working and does more of it. And a smart lazy person looks dispassionately at what has not worked, and they stop doing it. Lazy people are starting to sound pretty smart, aren’t they? 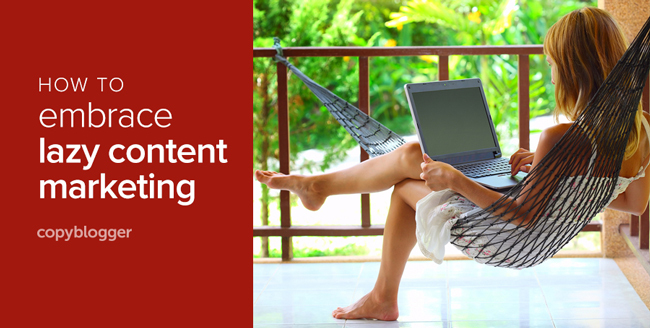 A lazy approach to content marketing is really smart. That’s the theme of the book I’m writing right now — the lazy approach to content marketing. I want to help you discover your own lazy approach to creating effective content so you can get maximum results from minimum effort. If you’ve thought about writing a book, you might be interested in my new podcast. Jeff Goins is coaching me through the process of writing my first book. Since I’ve never written a book before, I asked Jeff if he knew someone who I could work with as a coach. Jeff volunteered himself (lucky me!) and had the brilliant idea to make the book coaching process available to the public for free in the form of a podcast. If you want to hear a newbie (that would be me) ask an experienced author (that would be Jeff) all the questions a budding book author might have, tune in to Zero to Book. I’d love to hear your ideas about this lazy approach to content marketing, too. Visit the comments and let’s talk. Previous article: Is Social Media Making Us Dumb? Love the refreshing approach. I’ve often berated myself for not working as hard as others but now realise they probably just have more efficient systems than me. It’s all about working smarter, not harder. I particularly like the tip about not ‘reinventing the wheel’. There will always be new things to try but when you find what works for you – stick with it. Thanks, Jenny. And you’re right: working smarter, not harder is what I’m recommending! that morning/coffee routine suggests that we were probably related. I have a rule for myself: I can look at emails but not respond to them until I have at least one cup of coffee. Had to learn that one the hard way! This article caught my eye because I am constantly denying my own laziness. My style of laziness is a bit different though, it comes in floods and droughts. When I feel inspired, all I want to do is that one thing. Hard deadlines are definitely a motivator to feel inspired, but otherwise I have learned to embrace whatever I am inspired to do at that moment. Do I feel like writing a blog post? I’ll write 10. Thinking about making some cookies? Might as well make breakfast, lunch, and dinner too. In doing this I can still maintain consistency as long as I push out my final products consistently. Will you discuss different styles of laziness in your book or are you going to narrow in on different reproaches to deal with it? The book won’t be about laziness, but will talk about ways to make content creation efficient. And I’ll definitely touch on understanding your own work patterns and energy cycles! Thank you for your article! And for validating the way I work! I have many coworkers that are constantly throwing new, shiny technology at me to make my job “easier”, but I tend to be a fan of, “If it’s not broke, why fix it?” Now, for those procedures that are broken, I will happily take any advice that anyone can give me until I find a good, efficient solution. But I am definitely not a fan of trying every new coffee maker out there when mine works just fine, to use your analogy! Thank you for your thought-provoking and helpful article! I will look forward to following your book-writing process! Hey, Pamela! I’m a huge fan of Zero to Book, and every week I can’t wait to download your newest conversation with Jeff. I know I need better systems for my content marketing tasks. I do SOME efficient things when I’m writing and publishing posts (like keeping a running list of blog post topics), but there are other tasks that take too long because I’m re-inventing the wheel every time. So I’d love to hear more about your suggested content marketing systems. And for what it’s worth, I absolutely can’t wait to buy your book – it’s exactly what I need! Thanks, Beth. I’ve had so much fun recording those conversations with Jeff. I find myself listening to them again even though I was there the first time around: he’s got so much good advice to share, sometimes it takes a second listen for it to sink in. I’m in the process of writing the book now, and I’m aiming for a fall release. I’ll keep you posted! Pamela, I like your approach. We aren’t ‘lazy’; merely….efficient! What mind-mapping program do you prefer? Also, for text editing that is wonderful for eliminating distractions and beautiful to the eye, have a look at a (free) editor called Poe. It completely eliminates all visual stimuli and gives you a true ‘blank sheet of paper’. Makes for a nice experience when you just want to focus. Dave, I’m on a Mac, and use a program called MindNode Pro — but any mind mapping software would do it. What I love about working out my outlines this way is it gives me a place to dump out ideas, which don’t come to me in any kind of logical order. Once the ideas are there, I can begin moving them around until they make sense. Some ideas get eliminated, and others get added. I wait until the full outline is in place before I start writing. I will check out Poe: thanks for the recommendation! I understand Pamela have systems in place. Great advice which I will implement. What I don’t understand as a person that also has to have my coffee before I say anything to anybody is why in the name of civilization you don’t have a coffee maker that starts at a preset time? No need to press that one button to start the process. Maybe you don’t get up at the same time every morning. No matter, just get close and like magic, not only is the coffee made and waiting but on your way to get it you are enveloped by the aroma. That will quicken your step to speed up the process of becoming human again. Funniest comment so far, Barry. I guess I’m a coffee snob: I have a one-cup pour over system. Using it involves boiling water (electric teakettle is right there); grabbing a filter and filling it with coffee; then pouring hot water into it. It’s the first challenging thing I do every day, because I have to make coffee before I’ve had coffee. Got it. Glad you got a smile from it. Hi Pamela – I’m all about process and tools that work. Byword is new to me. What is the difference between it and TextEdit? Maybe I don’t understand what Markdown is. I am really picky about the font used when I write. It’s the decades of graphic design work, I think! Byword allows you to set a default font and apply some basic formatting so you can “see” what your content will look like before you finalize it. Can’t you go straight from OmmWriter to WordPress? If it allows you to save your content as text you might be able to eliminate some steps. Ommwriter allows no formatting whatsoever, not even bold or italic, so I may have to give Byword a try. I’m a visual person too (2 decades as a landscape architect) so Byword may be better for me for the same reason. BTW, I guess there is no way to subscribe to comments, so we just have to remember to come back to the conversation. I pretty much agree with everything that has been said in this post, many a time have I come across lazy individuals who when given work will complete it in the most time efficient manner simply because they can’t be bothered to spend much time on it. And to be fair for the most part the quality of work isn’t bad either as, like you said in the post, they do not re-invent the wheel and simply use practices and techniques that time has proven to be efficient. Thanks for the easy to read post, you got yourself a new reader! This was very interesting read. Lazy is such a negative word but when you’re a freelancer it can really help you to keep things in perspective & not burn out. Thank you for a great read! Wow, great opportunity with Jeff — can’t wait to hear that podcast! Thanks, Carol! I’m grateful, and glad he wants to share the process, too. LOL… you had me at “lazy” and I just had to figure out what your angle was. It’s clear you didn’t mean “lazy” in the real sense of the word because lazy people don’t even take the time to develop systems and processes. I love that you are really talking about learning how to work smarter, not harder. Maybe it’s not even that; it’s worker smarter so that we can be efficient doing other things that help us be profitable as our content is working for us both in front and behind the scenes. One thing I’ve learned in ten years of entrepreneurship is that in the beginning if you work hard, develop the processes and systems and learn what business you’re ‘really’ in from the public’s point of view… you can get exactly where you want to be. The thing is content is hard to create without a foundation and framework. 1. What are the “specific” problems you are passionate about solving? 3. What are the “specific” problems you solve for each tangible value? 4. Who are you “specifically” solve each problem for (in detail)? 5. How are your products or services “a” part of “a” solution? Once they are done they could have 88 pages to 150 pages or more. The clarity that comes from the process yields them incredible results because the sytem is created. Now, they can take the lazy approach you mention to creating highly targeted, specific content that is relevant, meaningful and inspiring to their audience. I’ll be keeping a lookout for your book. Have a great second half to your week. Good article. I was wondering how you were going to put a spin on being lazy. I was going to leave a longer comment, but I was feeling too efficient. Be consistent is the key here and I totally agree with that, people can’t expect making sales with just few minutes of work, maybe when the project is quite advanced people can manage it to have an automated system with almost no work, but to start with is important to be active and push forward with content and promotion. I feel exactly like yourself, I avoid everything before my cup of coffee, because I’m like in zombie mode and I can’t do anything right, you made me laugh because it was like my daily morning. Great content as always Pamela! you’re awesome, thanks. Lazy people don’t waste time doing things that don’t work, I know because I’m a lazy person. I want to have things in place that do the job, and then I find the tools that do the job I don’t let them go. I rarely chase the shiny new objects simply because it’s just too much work! This is such a great analogy, Pamela. “I can only imagine how disastrous my mornings would be if I had to deal with a different coffeemaker every time I walked into my kitchen. Even though I need to create systems that work for me, it is helpful to hear what works for others—not to chase—yet to have options and tools to find what does work for me. Great podcast you and Jeff are doing. Lucky for you and lucky for us, too, that you are both willing to share. And even though I have no plans to write a book, much of the discussion and ideas apply to writing blog posts, too. This is such an interesting analogy, definitely taking away a few tips on efficiency as I often get distracted by the shiny new systems. Great insights, and I love that you advise us to run in the other direction if you see “just add water” promises. Pre-processed content? Yuck! I much prefer to use fresh ingredients–but there’s no reason to start from scratch every time. There are wonderful tools and formulae out there to inspire us copywriters and content marketers. Having a framework or a template you like to use is simply a recipe–what you do to add to the flavor is up to you! When I was at university all my friends thought I was incredibly lazy. So it came as a massive surprise to everyone that, after we all graduated, I was the first one to land a meaningful job. But the reason for this was the very fact I was lazy. I decided I wanted to get a job by making as little effort and completing as few applications as possible. I quickly realised that, rather than spreading myself thinly and sending generic applications to loads of different employers, I’d get quicker results through more careful targeting and concentrating effort on those applications. At that time, I was looking for engineering work, as I’d just graduated in a related discipline. Little did I realise that what I was actually doing was a smart marketing trick. And that, one day, I’d eventually move into a career in marketing. Revenge of the lazy (efficient) job seeker. That’s a great story, Kevin: thanks for sharing it! And everyone then said I was dead jammy (lucky) to find a job first. But that’s another story – making your own luck. Fantastic tips and tricks and ways to go about content creation. I do have one question: which mind-mapping software do you use, and if you have time, reasons why you like that particular software. I use MindNode Pro, mostly because it has a very simple, uncluttered interface. But any mind mapping software should work. Hey Pamela. Why do you copy Ideas (outline) from Evernote for writing in byword? Isn’t it a friction again? Evernote does have a distraction free full screen mode, so what is the benefit of using byword? At the End, you are able to use Markdown in Evernote, which is transcodeable in html in most common CMS-Systems. I start with mind mapping software: that’s where I organize my ideas. Once they’ve got the structure I’d like to use in the post, I copy/paste them into Byword. Crackin post……made me chuckle…..was this the desired effect ?? Anyway, after tearing up my existing posts ( due to the fact the copy was horrendous to say the least ), off i went in search of inspiration. Having found the Copyblogging crew ( and yourself ) i have immersed myself in everybodys posts , taking in the info like a human vacuum. On the subject of laziness…having studied your post, i pondered over the discipline of laziness & found i may have a natural talent for it. “Lazy people aren’t really lazy; they’re efficient” This is such a fantastic line! I remember thinking this all through out school when everyone around me would put in hours and hours only to get a score that is 2% higher. Who cares?!? Lazy people are masters of analyzing efforts for their ROI.